No Puma on our Main Street | Dunsborough say it's wrong! Dunsborough’s fight to save its main street-It’s over. We won !!! This website describes the three-year fight the small, south-west Australian town of Dunsborough has had to stop a petrol station blight its main street. A street that already has two petrol stations within 300m. See here for more background. January 2, 2019 the developers, DCSC, announced that their agreement with Puma Energy lapsed Dec. 31, 2018 and they would not be proceeding with the development. unpredictable approvals process” They made no reference to the fact the vast majority of the residents were opposed to the development and that changes in the city’s zoning definitions were underway before the development application was ever submitted. Their press release can be viewed here. Dunsborough got a great start to the new year Wednesday with developers DCSC announcing that the proposed Puma petrol station/convenience store development in the centre of town will not be proceeding. The company, which owns the adjacent shopping centre, said Puma Energy and DCSC mutually agreed not to extend the agreement to develop the site on Dunn Bay road. They said they were “thwarted by a long, expensive and an unpredictable approvals process.” The development application was initially submitted in late 2015. The community group Puma2Go wants to thank the residents of Dunsborough for standing up and fighting this development from day one. From the initial JDAP hearing in December 2015 residents made it clear a petrol station disguised as a convenience store was not needed or welcome in our main street. From rallies to donations to volunteer work, the residents never gave up. Over 4,000 signatures opposing the development were collected and over a thousand pledged to boycott the development if it went ahead, The group also wants to thank the city for working to support its community and the local state representatives, Diane Evers, Adele Farina, Colin Holt and Colin Tincknell for their support. Finally the group wants to acknowledge the tenacity of the Presiding Member of the South West JDAP for not giving up the legal battle over the last three years and eventually getting a win. A Puma2Go spokesperson said the group is surprised the developers blame the state for being able to “change rules at will” when a change in zoning definitions was already underway prior to the development application being submitted and it was clear from day one the city and the residents were opposed to the development. “It is reassuring to know that sometimes there is justice in this world,” he said. 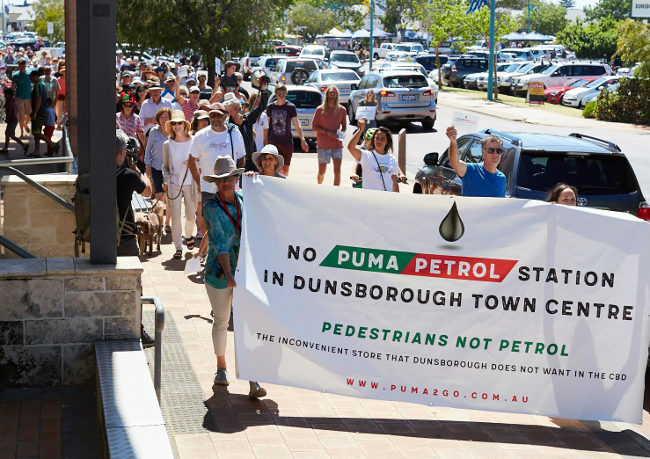 The group welcomes Puma or any other petrol retailer to Dunsborough, just not in its main street, and is willing to work with the developers to explore other opportunities for their land. Court Upholds Appeal-Big win for Dunsborough! The W.A. Court of Appeal, Monday, December 3, has upheld the appeal against the State Administrative Tribunal (SAT) decision that allowed the Puma petrol station in Dunsborough. The issue now goes back to a new SAT panel. As there are now new service station and convenience store definitions in place it is highly unlikely the development will succeed. The full details of the decision are here. The developer, DCSC, now has the option to appeal to the High Court. They will be arguing against a three judge unanimous decision. Or it can see the issue go back to a new SAT tribunal which may or may not call for a new hearing-the tribunal’s choice. The tribunal will be operating under the new(ish) City of Busselton definitions of a service station and a convenience store. These are the state definitions and undder them a convenience store does not sell petrol. So the development will be a service station. In that location a service station is a discretionary development and both the City and the JDAP,the state planning body have determined that the development should not be allowed there. Puma2Go is calling on the developer, DCSC, or specifically the four local and one Perth based investors behind the company to think again about that location. We are asking them to make a positive contribution to the community. Leave a legacy not a nightmare. The WA Court of Appeal Monday reserved its decision on an appeal to a Supreme Court decision that would have allowed a third petrol station in Dunsborough’s main street. The State Solicitor’s Office lawyers, acting on behalf of the presiding member of the Southern Joint Development Panel (SJDAP) argued that the State Administrative Tribunal (SAT) ruling that the petrol station was actually a convenience store was a preliminary decision that was later superseded by a change of definition of a service station. It had been argued in the Supreme Court that a later SAT decision should have taken that change into account. It also argued that the local Dunsborough developers, DCSC, had no “acquired” or grandfathered rights from prior to the definition change. Both arguments need to be successful for the appeal to be granted. In August 2015 the City of Busselton altered its service station definition to cover petrol stations selling convenience products.. However the new definition did not come into law until August 2017. In the meantime, aware of the pending change, the developers submitted a plan for a convenience store with 6 petrol bowsers. (A convenience store is a “permitted” development while a service station is a “discretionary” development. In other words it is harder to stop a convenience store development) The City of Busselton and the SJDAP argued that development was a service station under the old definition. This was rejected at a SAT decision in 2016. The development was again challenged by the JDAP at the SAT as a convenience store. This was also rejected, but the decision was given after the new definition became law, putting the decision into question. This decision was appealed in February to the Supreme Court and in May the appeal was dismissed. It was this decision that was being challenged Monday in front of a three judge panel. The JDAP lawyers requested the issue return to a new SAT hearing if the appeal succeeds. The DCSC lawyer agreed that if the appeal succeeds the issue will start all over again at the SAT. Earlier this year the City of Busselton revised its convenience store definition in line with the state definition making it harder for the development to proceed as a convenience store. Local community group Puma2Go was impressed with the JDAP lawyers arguments and the group is cautiously optimistic. It is now calling on the developers, DCSC and Puma Energy to move on and stop wasting tax payers money. There are other more acceptable locations in Dunsborough for Puma and there are a range of alternative uses for the valuable land in the centre of town. The group is also calling for the state government to intercede as the development lacks the buffer zones as required under EPA guidelines. This is a growing problem in the state as petrol station operators expand operations. DCSC cross appealed in court, seeking indemnity damages, arguing there had been an “oppressive use of process” in the courts. He argued the courts had been unaware of the pending change of definition and if they had, he would have argued differently. However in the first SAT hearing the JDAP lawyers tried to arguing that the pending definition should be considered, but was dismissed by the SAT “judge”. The DCSC lawyer conceded if the JDAP appeal succeeds his argument would fail. 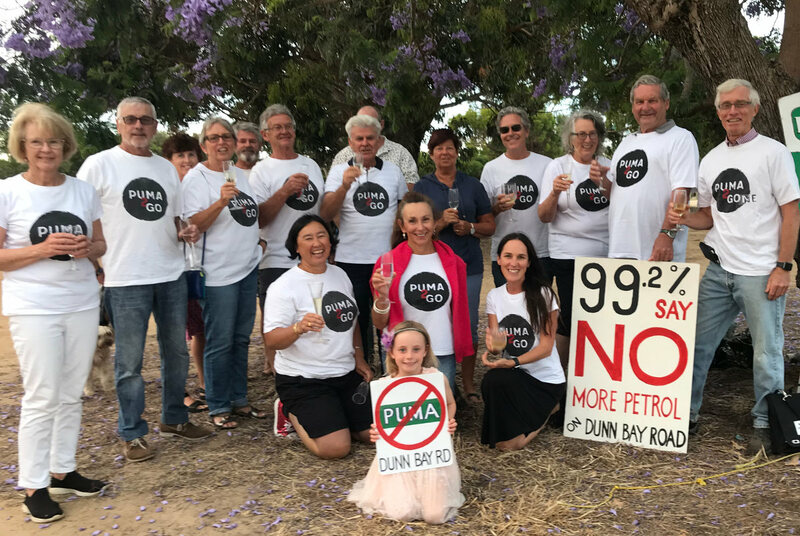 Puma2Go will be going back to court again in Perth Monday to support the Southern Joint Development Assessment Panel in its attempt to overturn last May’s Supreme Court decision that would allow the Puma petrol station to proceed. It is expected the hearing will begin at 10:30. Meanwhile on October 31, the Metro Central JDAP deferred its decision to allow a Vibe petrol station to be developed adjacent to Eden Hill Primary School without the recommended buffer zone. Background on this can be found here. DCSC, the local development company that wants to put a petrol retailer in the centre of Dunsborough, Friday lost its attempt to block the appeal to the Supreme Court decision which allows the development to proceed. At a Directions Hearing in Perth the judges ruled that any complaints about the appeal could be heard at the appeal and it would go ahead. DCSC lawyers argued there had been an “abuse of process” They said they were going to apply for an expedition to speed up the appeal process as their clients were losing $24,000 a month due to delays. In August 2017 the State Administrative Tribunal allowed the developement to proceed. The next month the State Solicitors Office announced it would appeal that decision. That appeal was heard in February. In May the Supreme Court turned down the appeal on one of the arguments put forward and did not accept the other argument. This decision gave the green light to the developers. The Southern Joint Developement Assessment Panel subsequently decided to appeal that decision. The developers (see here) are now trying to stop that appeal. The Dunsborough community has urged the multinational oil company, Puma Energy, to rethink its plans and locate its new petrol station/convenience store in the town’s light industrial area (LIA). In a full page ad in Friday’s West Australian newspaper the residents of the small holiday town have asked Puma not to put its 6 bowser petrol station in the centre of town, adjacent to two other petrol stations. Instead it should be located in the LIA where there is space and a demand and would allow it to provide needed services such as a car and boat wash.
Puma Energy, a Geneva based company, has been expanding rapidly in Australia since entering the market in 2013 and has yet to pay any income tax. It has failed to respond to the town’s requests in the past and the company’s Australian general manager has refused to return phone calls from the mayor. The government is seeking in the Court of Appeal to appeal the Supreme Court May 10 decision that effectively gave the green light to the Puma petrol station on Dunsborough’s main street. According to the Department of Planning: The Southern JDAP has sought to appeal the Supreme Court decision not to allow an appeal on the SAT decision to approve plans for the Dunsborough PUMA service station. There will be a community meeting at Clancy’s, Friday, July 27 at 5:30 to plan further action. 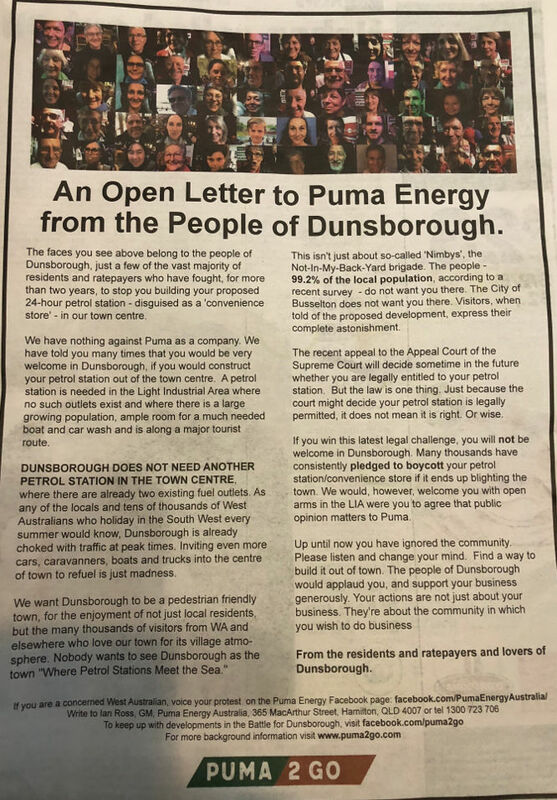 The Puma2Go community group is warning potential franchisees for the proposed new petrol retail operation in Dunsborough, they can expect no sympathy when the business is boycotted. At this stage it appears the Puma development will go ahead in the town’s main street. but we all know just because it is legal, doesn’t mean it is right, a spokesperson for Puma2Go said. “The five local developers need to remember that when you do something that runs against the wishes of up to 99% of the community it creates a lot of ill will. That ill will doesn’t disappear when the first tree is cut down, or when the six meter Puma sign blights the skyline, it lasts for years. The developers will be giving a permanent six meter finger to the Dunsborough community, a memorial to their lack of respect for the wishes of the town. And whoever acquires the franchise should expect no sympathy when they complain about a lack of business due to the boycott. They have had plenty of warning.“ he said, in reference to the over 2,000 pledges to boycott the development. The WA Supreme Court on Thursday, May 10 dismissed the appeal against the SAT decision allowing the development of a Puma petrol retailer in Dunn Bay Road. However the community group, Puma2Go has pledged to continue the fight against the development in Dunsborough’s main street. The decision comes quickly on the heals of a Notice of Motion passed by the City of Busselton council Wednesday urging the city work with the parties to move the development out of the centre of town and to look into enforcing the convenience store definition that limits the sale of fuel to just petrol. Dunsborough residents are urging the City of Busselton to stick to the letter of the law and prohibit the sale of diesel at the proposed Puma “convenience store” in the centre of Dunsborough. The six bowser operation was approved as a convenience store under the COB’s old definition by the State Administrative Tribunal (SAT). Under that definition, convenience stores can only sell petrol, while service stations can sell petroleum products. Community group Puma2Go said Wednesday this restriction should be sufficient encouragement for the Geneva based petroleum retailer to move its development to the Light Industrial Area where it could operate as a full function service station, providing useful services such as a car and boat wash. This would be in line with community sentiment with over 99% of Dunsborough residents preferring the petrol station in the LIA rather than Dunn Bay Road, according to a recent survey. Busselton made its position clear in its planning assessment at the initial JDAP hearing on the development “The land use of a ‘Convenience Store’ is where the retail sale of convenience goods occurs, and can include the sale of ‘petrol’ (but not, specifically, other petroleum products, such as LPG or diesel)” . This statement was not challenged in either SAT hearing or at the Supreme Court. The initial SAT decision which allowed the development to proceed as a convenience store quoted an earlier Puma decision saying that “the primary focus and emphasis of the proposed development is on the retail sale of petrol and convenience goods commonly sold in supermarkets, delicatessen or newsagents, rather than on the retailing of fuel and petroleum products” and consequently the development was allowed to proceed as a convenience store. The Puma/DCSC lawyer, Michael Hotchkin clearly understands the issue and in 2015 wrote that the definition of a convenience store includes “the sale of petrol”. Whereas a Service station, which would have been a discretionary development and therefore not allowed, caters for the sale of “petroleum products”. Also, the initial Puma plan shows just one fuel inlet for the storage tanks and it is designated petrol. It is thought that the difference in fuel retail regulations was due to planners not wanting large diesel trucks and farm equipment filling up at convenience store locations, which would be in more residential or urban neighbourhoods. Environmental lawyers tell the community group that the city could enforce the restriction by way of its compliance powers. A Puma2Go spokesman said the town’s main street will be blighted for a generation due to the SAT following the letter of the law. “We are looking to the city to follow suit and make it clear to DCSC and Puma that if they want to proceed with a fuel retail operation in the centre of town, it will be restricted to petrol sales only.” the spokesman said. The Supreme Court of Western Australia heard the appeal against the decision approving Dunsborough Puma petrol station development Monday, Feb. 12. The judge, calling the case unusual, said she will have to consider the matter carefully and will deliver her judgement “in due course”. On January 24, 2018 the WA Minister for Planning, Rita Saffioti, approved the City of Busselton’s new definition of a convenience store. This brings it in line with the state definition which does not include the sale of petrol. An interpretation of the old definition allowed DCSC/Puma to successful argue before the SAT that the 6 bowser fuel retail operation was a convenience store, making it easier to get planning approval. 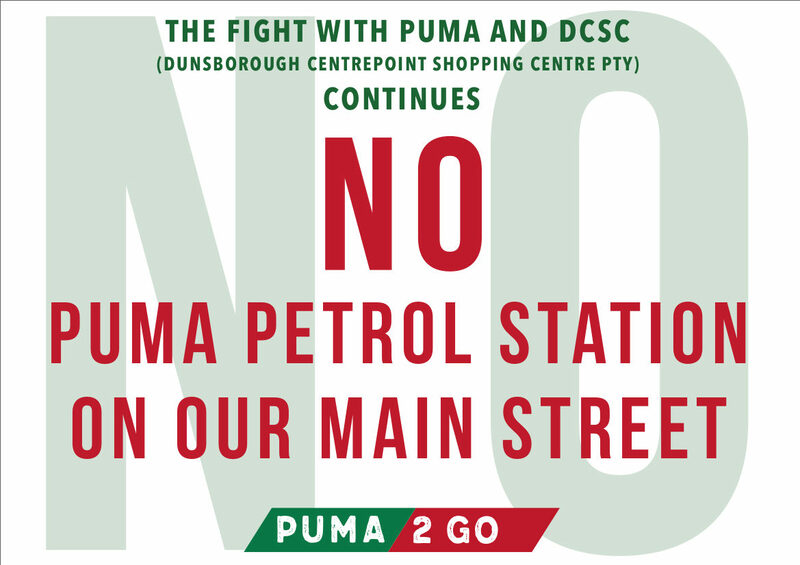 A poll released this week shows that over 99% of the residents of Dunsborough do not want the Puma petrol station/convenience store in the centre of town. The poll, carried out by the Dunsborough and Districts Progress Assn, surveyed more than 10% of the residents of the 6281 and 6282 postal districts (Dunsborough and the surrounding area) and found that 99.2% wanted the petrol retail operation on the outskirts of town, rather on than on Dunn Bay Road. At the SAT hearing last February, the presiding member (judge) threw out a petition signed by over 4,500 requesting the development not to go ahead. She dismissed the petition as she could not be sure all those who signed were from Dunsborough. For this reason, the survey was restricted to Dunsborough residents and ratepayers. Under state planning law local governments (and DAPs) are required to take into account the impact of the development on the local community. Puma Petrol Station in Dunsborough-The saga enters its third year! In late 2015 the City of Busselton published plans by local developers to put a third petrol retailer in the centre of Dunsborough on Dunn Bay road, 300m from two other service stations. That plan and the subsequent Development Appeals Tribunal (DAP) hearings galvanized the Dunsborough community and Puma2Go was created to fight the development. In late September 2017, the JDAP appealed a decision by the State Administrative Tribunal (SAT) that allowed the development. The Supreme Court will hear the appeal in Perth February 12, 2018. 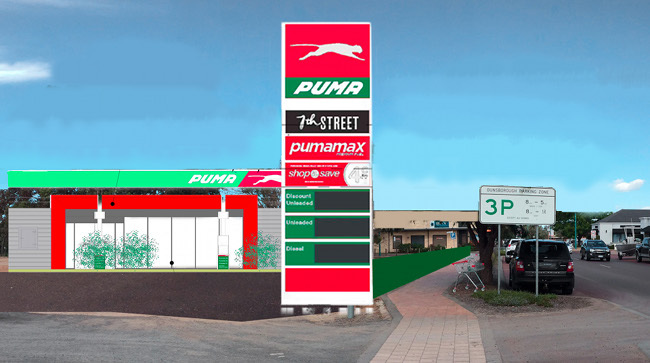 The SAT decision, allowing a six bay Puma petrol station (disguised as a convenience store) to fill the second to last vacant block in Dunsborough’s main street-Dunn Bay Road was not surprising, given the comments made at the hearing by the senior presiding member. However it was a big disappointment to the Dunsborough community. After the decision was announced the community met and decided to continue the fight. The DAP subsequently appealed the decision. The appeal was heard by the Supreme Court of Western Australia Monday Feb 12, 2018 and the judge reserved her decision. This website sets out the issues and background and outlines what can be done to help prevent this development going ahead. If you have any suggestions or comments, please go to the Contact Us page.